The Grand Canyon is often claimed to be the most spectacular natural feature on earth. Carved by the Colorado River, the canyon spreads almost 278 miles across northern Arizona. It ranges from less than a mile to more than 18 miles wide and is more than a mile deep in places. 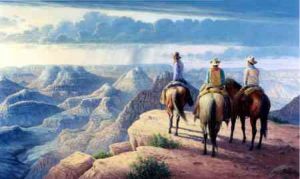 The Grand Canyon has captured the attention of these 3 men who have paused along the trail to enjoy "A Grand View."